Portable Propane Tankless Water Heater – EZ 202 is perfect for those who love to be outdoors. A lot of people would want to spend time in the outdoors camping or in the beaches swimming. However, believe it or not, one of the reasons why someone would think twice or retract is because of the unavailability of hot water. It used to be that hot water for bathing outdoors is only available by heating water using a kettle. That is definitely time-consuming. For people who do not want to bother boiling water for their cleaning purposes, they would have to bear cold, sometimes freezing water, while they are taking a shower, or washing parts of their body in their cabins or RVs. Those pose risks. Hypothermia is real, and children and the elderly are the most vulnerable. Thus, it is important that when planning to stay outside the comfort of “real” houses, there is warm water available for everyone. The good thing is that portable propane tankless water heaters have been introduced. Hence, availability and accessibility of hot water outdoors should not be a problem anymore. These portable on demand propane tankless water heaters are heaven sent, especially for those families who would like to bring children or elderly family members on camping trips. They can be a staple in each cabin, barn house, RV or pick-up truck. A product that belongs to such line is the EZ 202, and we will review it thoroughly to help you decide whether it is a good buy or not. As the name implies, this product gets energy from propane tanks. It very efficiently heats up water using either Winter or Summer options, as well as a flame level. These settings, including water flow, can be modified using an easy-turn knob. This portable water heater uses 2 D batteries to ignite. It also has a digital display to show the temperature reading of the water it is dispensing. Additionally, it comes with a hose and shower head, which can be brought anywhere together with the water heater unit. Further, the unit looks high-class and durable, and the knobs and slots are very firmly put together for a long-lasting portable water heater. The connection holes or slots in each unit come with labels that instruct the user where to put which hose. It has one for gas inlet, water outlet, and water inlet. Likewise, it is also very easy to set up and use and provides hot water in a simple turn of a knob. A camping trip usually involves more than two people. This portable tankless water heater provides 3.2 gallons of heated water continuously with a consistent temperature. Thus, this can allow someone to take a quick shower while another person cleans a greasy barbecue grill. Since the temperature is also steady, users are also assured that accidental burns are avoided. This water heater does not require high pressure to work properly. It only requires batteries to activate the ignition. In fact, it works well even if used with a garden hose, which is what is readily available during outdoor activities. Provided there is enough ventilation as this portable water heater uses propane, it can easily be installed in small cabins, lake homes, and campsites for everyone to enjoy. Doing this will make sure that there is always warm water available in these rest houses. No more forgetting the heater at home. This water heater has an automatic shut off that is programmed every 20 minutes. That makes it more energy efficient than other portable water heaters on the market. Also, this heater provides up to 40 relaxing lengthy warm showers from only one tank. In addition, this feature makes sure that it is not overused or it will last for many years to come. One of the main reasons why people avoid going outdoors is because of the unavailability of warm water. 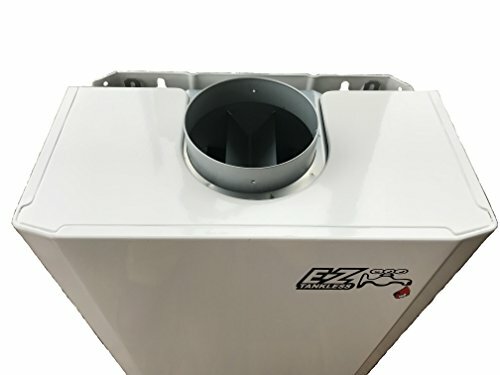 Having the Portable Propane Tankless Water Heater – EZ 202 will definitely make it easier for someone to convince family members and friends to explore the outdoors and enjoy fun activities. The byproduct of heating the water using this propane heater should be exhausted out somewhere. So you’ll need an exhaust vent. It is important that if someone wants to install it permanently in a small home, there is ample ventilation, so the air can circulate and eventually come out of the structure. This one does not come with anything else but the shower head and hose for the shower. The buyer needs to purchase the propane gas connector hose and regulator separately. They also need to make sure that they are buying the correct size as it has been reported that the size of the hole for the propane is not the standard size. Portable Propane Tankless Water Heater – EZ 202 is a good buy as it heats water outdoors efficiently. The great thing is it is energy saving, and it does not need a lot of pressure to work properly. Also, it can operate using a small water hose, and provide enough warm water consistently and continuously. Another great brand, the Camplux 5L 1.32 GPM Outdoor Portable Propane Tankless Water Heater only puts out 1.32 gpm of hot water. 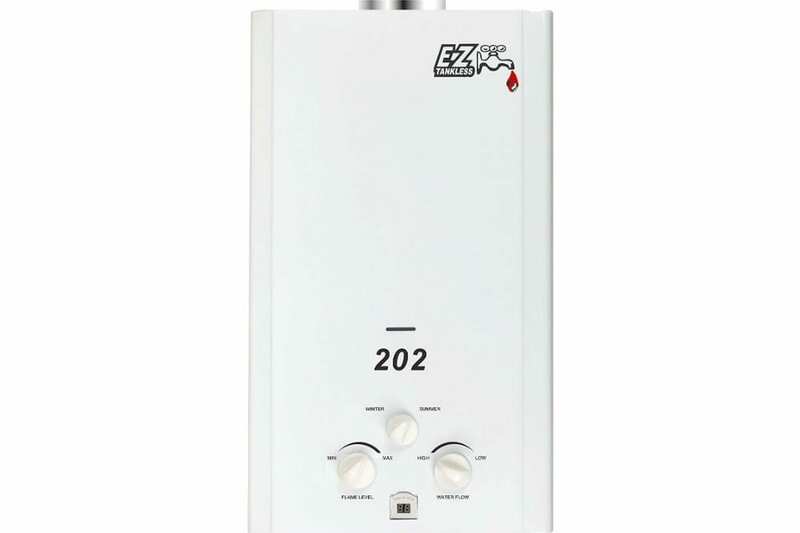 The Portable Propane Tankless Water Heater – EZ 202 provides more hot water at any given time. The EZ 202 can make 3.2 gallons, while most portable propane water heaters can only make around 1.3 gallons. This portable water heater is definitely more convenient and a better option for everyone who will join the trip or vacation. EZ 202 can be named as one of the best choices among all other portable propane tankless water heaters available on the market. That is because of its ability to provide more hot water than any other brands and model. Also, it could be both mobile and permanent, and energy saving. You might also like this: The Eccotemp L10 is a reliable outdoor tankless water heater that is perfect for camping, lake houses, cabins, and farms.